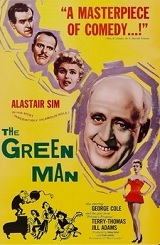 Work has been going with a bang for freelance assassin Hawkins (Alastair Sim) but a job in England just after the war is a different matter. His apparently easy target, a pompous government minister, is off for some hanky-panky at The Green Man on the south coast, where Hawkins is planning to retire him for good. But before he can get on with this the hit-man has a procession of unwanted visitors at home to dispose of - one way or another. Also stars George Cole and Terry-Thomas. And with Jill Adams.